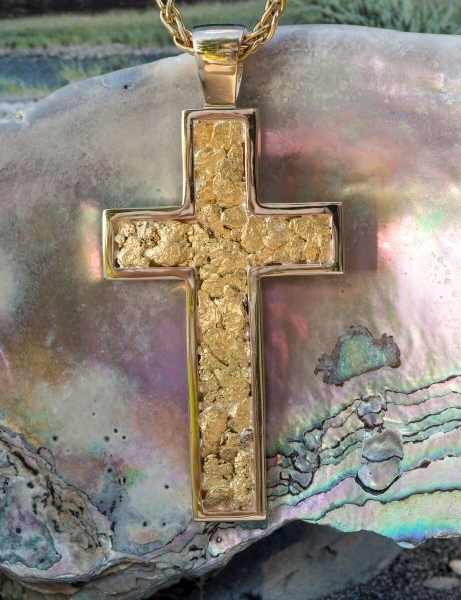 Length: 54 mm or 2.125"
Width: 26 mm or 1"
Stately cross 14Kt yellow gold with natural Alaskan Gold Nuggets. The chain displayed in the picture is a wheat chain which you can select from the drop down option above. The wheat chains you can choose from are all solid 14Kt gold and are the strongest we have found in the industry. If you have questions or would like to order a different size, please call us at 907-456-4991.